This week Cal Expo produced only two return wins from our watch list and both were nabbed by the public. Red Star Gilda returned to pay the most, $6.40, while Hell N Damnation fooled no one, paying $4.20. The list had a few big winners at The Meadows. 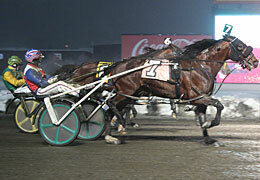 This past weekend Andovermetreasure paid $14.80 after a dramatic finish that lasted the entire stretch drive. Two others from watch lists at The Meadows that were not reported here last week were DVC Givemeattitude, $22.60, and Dragon’s Blood, $21.20. At the Meadowlands we were aware that the favorites in the weekend series’ finals would be hard to beat but we tried to do so (see “Prices” paragraph below). In the Tender Loving Care Final (TLC), the favorite we mentioned, Some Girls Do, won for fun and our prospective upset entry, Mystical Diva was second at 19-1, completing an exacta worth $29.60 if you took “Diva” for second to the 2-5 choice or boxed them. Though we never suggest playing to place, we know some players take our longer priced suggestions and play them to place as well as to win. Considering there was no show betting in the TLC, $6.60 to place was very good. The Cape & Cutter Final went to Laughandbehappy, no surprise to anyone. Our choices were seventh and eighth and remain on our Meadowlands watch list. Saturday, the same scenarios appeared. Meirs Hanover destroyed the Exit 16W crew almost odds-on and Allthatglitrsisgold, that big winner for us late last season when we warned of his improvement (Lisa Photo on left), won the Aquarius for fun at a rather generous 2-1. Our choice was coupled with the place horse, so, again, if you handled the exacta with the mild favorite and the “entry,” boxed or straight, you got back $22.40. Our “suggested contenders” are all about cashing in for the best prices we can expect. It is unfortunate that we cannot be on the spot when we release them or our watch list candidates, so we become victim to the splash of money that is sucked into the pool late in the wagering of races. This is why some of our recommendations win at very low prices. We remind you, however, that low prices are subjective. For the most part, many more of the horses we follow that win pay over two digits but we do take credit for the others, since there are times we personally assess lower possible payoffs as value (see Aquarius explanation above). Playing horses we present as viable investments at 4-1 or up has been a tried-and-true profit-making plan since we began consulting six years ago at the ill-fated Youbet. It is still a sound policy now that we are at TwinSpires. Our suggested bets offering $10 or more since we began this blog have been enough to make a profit at the harness races if they were all you wagered. That is including the fact that we urge you follow horses that lose the first time off our lists and win the first time off our lists, much of which we described in last week’s blog. So even though how you use our suggestions leaves the judgment up to you, be aware that we are very sure about some horses being favorites and promising low prices, which is why we look for the horse with the best chance to upset at a better price and those are the horses that we print here. A few weeks back, when TwinSpires carried the Prix d'Amerique from Vincennes in France, this side of the pond got a look at a genuine champion, Ready Cash. The trotter won the coveted race as the public choice, which is no easy task in that event. Last week, Ready Cash was invited to race in the sport’s seasonal championships, the Breeders Crown. This week, Ready Cash’s connections accepted. The “Crown” races in 2011 will all go on the same night, as they did in 2010, only it will be at Woodbine, not in America. We hope to bring you the Crown this year as we did last season, live, either from Canada or via streaming on the ‘net to TwinSpires. Simon Allard, a regular at Ontario’s ‘B’tracks, has settled at Woodbine and is becoming a major force there. The 28-year-old reinsman is currently third among all drivers there with 29 wins, merely a dozen or so behind leading driver Jody Jamieson. Players should know that Allard has been a flat-bet profit at Woodbine but only due to two wins over the past two weeks that shattered the toteboard. These two wins paid $74.90 and $71.50 and made up for his losses along the way. Those being ignored, his average win price since Feb. 7 is $6.35. The highest odds in that percentage were 5-1. So beware of the hubbub, Allard is not showering backers with a majority of big prices.